Very few people know about the wines of Seyssuel. I suspect even fewer have tasted them. But this small wine region has a history as long as any other in the Rhône valley and the potential to rival its neighbour Côte-Rôtie. Looking out over the vineyards of Seyssuel with the Rhone flowing past. This vineyard belongs to the Cuilleron, Gaillard and Villard “Vins de Vienne” team. 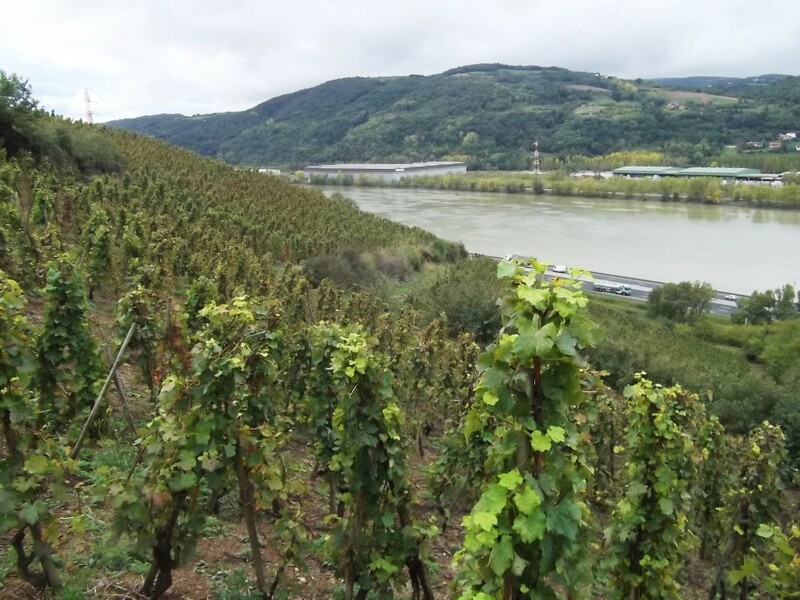 The Seyssuel vineyards face south and southwest looking out over the river on a steep hillside just north of the town of Vienne. Traffic on the Paris-Marseille autoroute roars by at the foot of the slope. Côte-Rôtie and Condrieu lie a little to the south on the opposite bank. Vienne was an important town in Roman Gaul (you can still see the remains of their occupation today, 2,000 years later) and according to Pliny the Elder the Romans enjoyed the local wines – apparently, there were three types of Seyssuel called Sotanum, Taburnum and Heluicum. And despite the odd hiccough – in the harsh winter of 1563 the vines were ripped up by fighting soldiers to use as fuel – winemaking carried on in Seyssuel for the next 1,800 years. 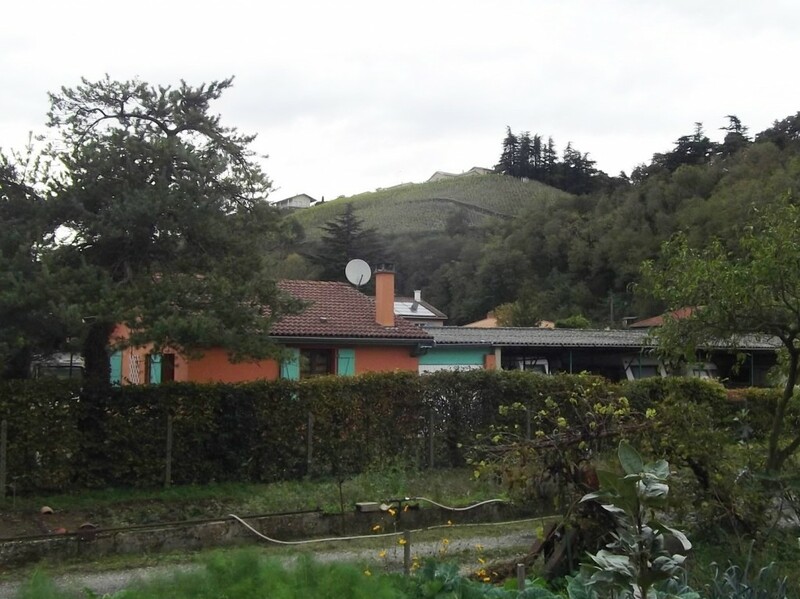 In the mid-19th century there were some 100ha (250 acres) of hillside vineyards. Then, in 1883, the phylloxera aphid arrived and within a few short years the vineyards were decimated. Although there was replanting, the First World War and the industrialisation of Vienne brought their own problems, causing a shortage of the manpower vital for working such steep slopes. It was all too much to bear – the vineyards were all but abandoned. Anybody who could still be bothered to grow grapes did so on the plateau above the river where the vineyard work was so much easier. The fact that the plateau growers chose to make bulk wine from poor-quality hybrid vines didn’t matter – the wine was destined only for the workers in the nearby factories. But in time even these vineyards disappeared as growers were encouraged to pull up hybrids and French drinking patterns changed. Chapoutier’s vineyard on the hillside above the village of Chasse-sur-Rhône. Taken on a cool, grey October day as the light was fading. Skip forward to the 1990s. Three celebrated northern Rhône winemakers, Yves Cuilleron, Pierre Gaillard and François Villard, decided that the time had come to resurrect the overgrown vineyards that they would pass regularly on the drive north to Lyon. A first inspection of the site in 1995 was followed by clearing of trees and scrub and the first vines were planted in ’96. 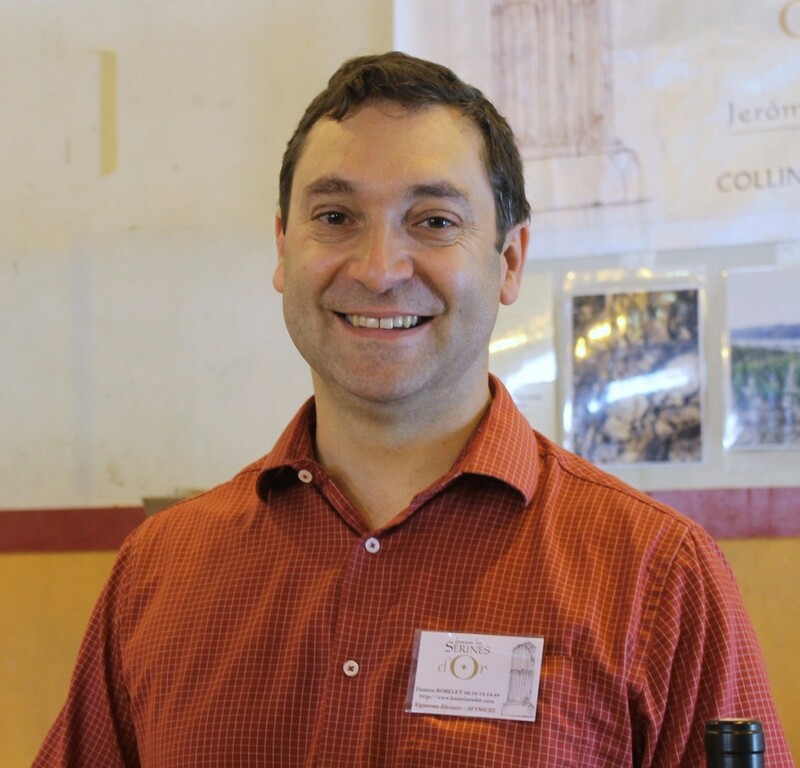 The trio were soon joined by others – Condrieu grower Louis Chèze; Alain Paret , who produces St. Joseph and Condrieu; Pierre-Jean Villa, who has vineyards in St. Joseph, Crozes-Hermitage and Côte-Rôtie; and more besides. Christophe Billon, who is part of the Rhône Wine Tours stable, is a member of Seyssuel winemakers’ association Vitis Vienna (although he says that his vineyard is in Vienne itself not Seyssuel), as is the famous house of Chapoutier, which has planted vines around 2 kilometres north of Seyssuel, above the village of Chasse-sur-Rhône. In the space of 20 years, Seyssuel’s vineyards have recovered from nothing to over 30ha (75 acres) farmed by 13 estates. 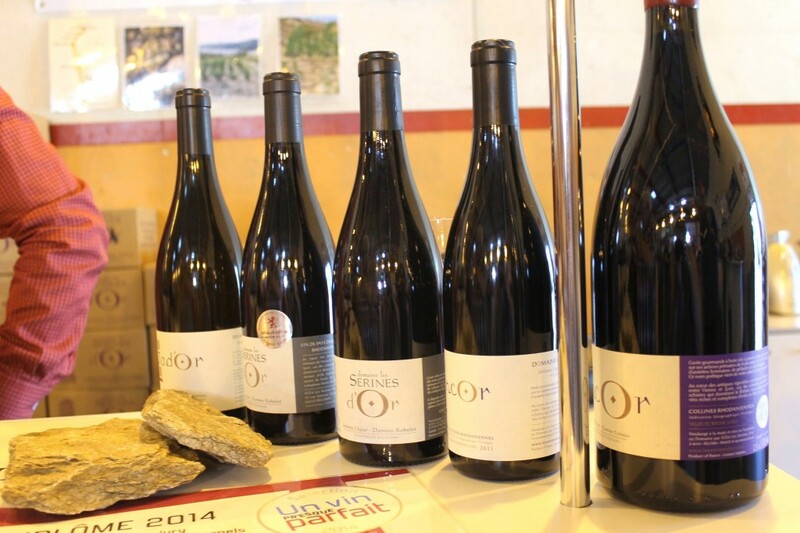 I went to meet Vitis Vienna member Domaine Les Serines d’Or to find out more. 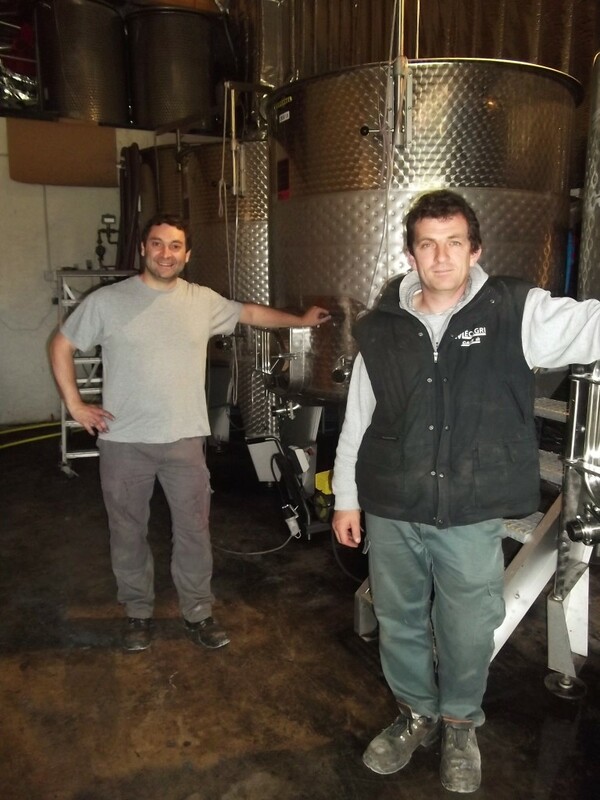 Damien Robelet (left) and Jérôme Ogier in the fermentation cellar of Domaine Les Serines d’Or. Les Serines d’Or line-up. The rocks show the make up of the vineyard soils, while the certificate you can just see at the bottom was awarded to Encore 2011 by the Un Vin Presque Parfait (“An Almost Perfect Wine”) Wine Guide 2014. Both their families made wine in the past – various parents and grandparents made wine on the plateau and even kept a tiny plot of hillside vines to boost the strength of the more feeble plateau product. Now Jérôme’s main business is fruit and fruit products (including a range of fruit flavoured eaux-de-vie – follow this link for more information) but there is a workman-like fermentation cellar attached to his house as well as a cunningly hidden barrel-ageing cellar underneath, which was where we tasted the maturing reds. Damien at the St. Peray wine fair. 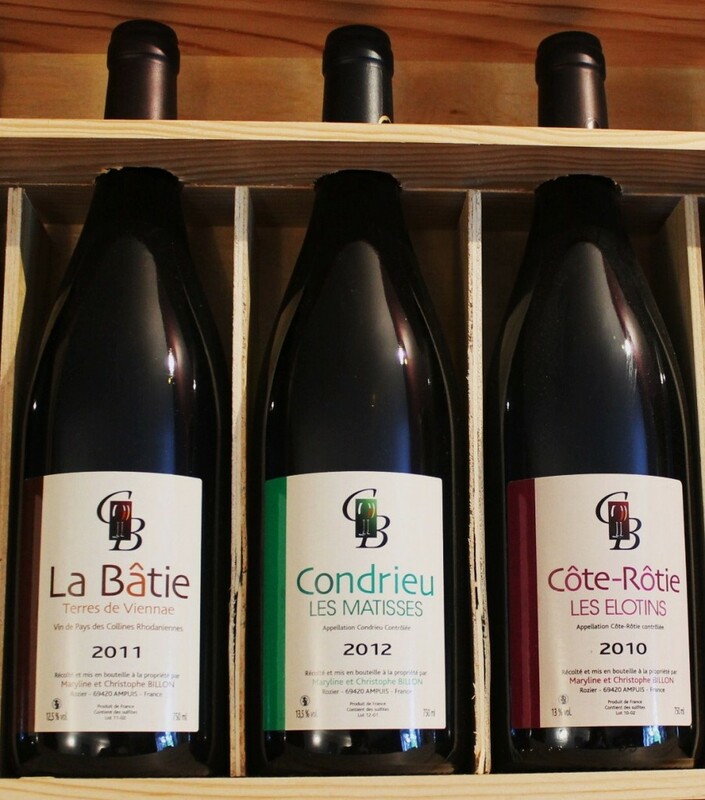 And what about the Côte-Rôtie comparisons? They are perhaps inevitable given Seyssuel’s close proximity and their shared use of syrah (and viognier, for that matter). Not only that, the two regions share the same mica-schist soils. Facing south-southeast, Côte-Rôtie catches the morning sun while Seyssuel, on the other bank of the Rhône, enjoys a warmer end to the day. (In its sheltered position with its warm micro-climate, ripeness is rarely a problem. Indeed, Barbary figs, which normally appear much further south, also grow here.) In short, when you taste the wines there is a clear family resemblance. But I would go further and argue that wines like Les Serines d’Or or Yves Cuilleron’s Ripa Sinistra shame many C-R’s. And it’s worth noting that Damien and Jérôme’s Jad’Or viognier trumps many a Condrieu. This is Cote-Rotie, snapped on a grey day in Spring. Notice how the vines are grown up crossed poles, as in Seyssuel. Other than the lack of foliage, the scene is very similar to the one above. So what are the downsides? Well, even the oldest vineyard in Seyssuel hasn’t yet hit 20, so some of the wines can lack a bit of old vine stuffing (although you could equally argue that this shows how great the potential is once the vines are older, given the quality that’s already being achieved). And, if you’re worried about such things, Seyssuel wines don’t have an Appellation Contrôlée label. 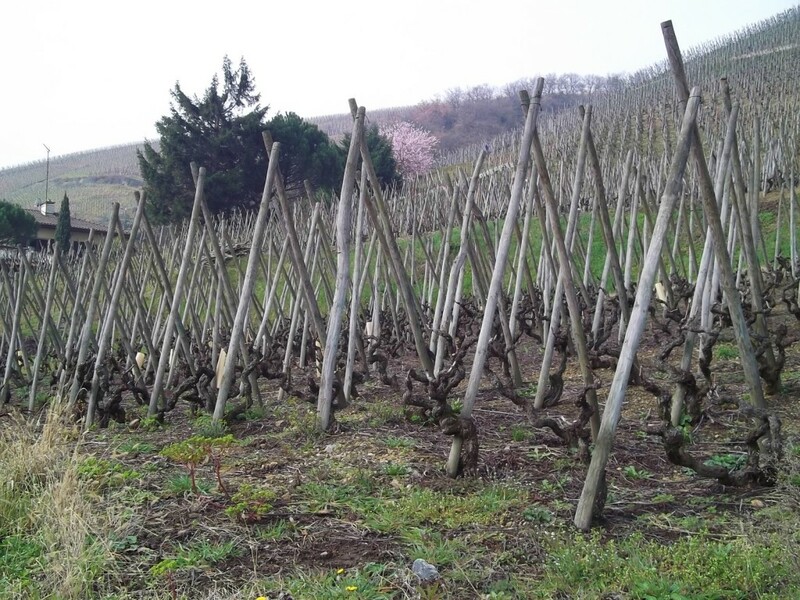 Because the vineyards didn’t exist when the appellations were being handed out, they are classified as Vin de Pays (or IGP) wines under catch-all Collines Rhodaniennes heading, which can cause problems for the winemakers, especially in their home market. Christophe Billon’s “La Bâtie” sitting alongside his Condrieu and Côte-Rôtie. Like Côte-Rôtie, like Condrieu or Hermitage for that matter, Seyssuel is a hillside vineyard region where mechanisation is all but impossible, meaning labour costs are high. In addition, the Vitis Vienna members have made a conscious decision to go all out for quality, working with very low yields and expensive, high-quality oak. All these things push up the price of the wine. Serines d’Or is priced in the mid-20€ bracket and EncOr around 17€; when I was a wine merchant in London selling Ripa Sinistra it was around £35 a bottle, and that was several years ago. However, much of the French public won’t even consider paying those sorts of prices for something classified as a “country wine”. The winemakers are struggling to get out of this hole and have collectively submitted a dossier requesting appellation status, initially as a part of the Côtes du Rhône family (thus turning the most expensive Vin de Pays into the most expensive CdR – marketing-wise, not great progress in my opinion), with the intention of being granted “Cru” status, like its neighbours, in the long term. Damien suggested that a Rhône satellite appellation – like that given to the Ventoux region – might be the solution. A response to the submission should come before the year end, according to press reports. I imagine that English-speaking countries care much less about the niceties of appellation status and are more concerned with quality, but that forces small-scale winemakers like Damien and Jérôme into exploring the export market. I certainly wish them all the best as their wines deserve a wider audience. Note: This is the blog of Rhône Wine Tours. If you’d like to go and see what makes Seyssuel special, get in touch and we can see if Damien and Jérôme are free. They would especially like to meet you if you are a wine importer with a love of fantastic syrah from obscure Rhône wine regions. In the meantime, you can explore the rest of the blogs and check out our Facebook page where most of our photos and short pieces get posted. This entry was posted on Thursday, October 23rd, 2014 at 1:27 pm and is filed under Wine in general, Wine Villages. You can follow any responses to this entry through the RSS 2.0 feed. Both comments and pings are currently closed.